If you really want to enjoy Central Oregon beauty, there really is no better way than to visit La Pine State Park – a park that could keep you busy for a week if you wanted to discover all of its splendor. To be honest, I went to La Pine State Park to see Oregon’s largest ponderosa pine tree, but during the visit discovered so much more. The park is located a few miles off the main thoroughfare in Central Oregon, Highway 97. Despite it being very easy to get to, the park is more than 2,300 acres and even during a busy weekend it usually feels like there aren’t many people. My trip started with a bee-line to “Big Tree,” a 162-foot tall ponderosa pine that is also 326-inches in diameter. It’s one big tree and very impressive. In fact there is more than 25,000 board feet of wood in the tree, which is mind boggling when you think about it. Over the years the ground has been trampled from visitors so the parks department has put a wooden fence around the tree to keep the tourists from hurting the root system. Experts believe the tree is more than 500 years old. According to the Oregon Heritage Tree Program, the pine is the biggest of its species ever recorded and it was giant before the Oregon Territory was established in 1848. The sign at the tree also said that recently the crown of the tree was lost to weather, but it remains the largest circumference tree. Directly around the tree are trails and a ponderosa pine forest that had many small ground squirrels and the Deschutes River runs throughout the park. Near the tree is access to the river. You can watch people canoe down the gently-flowing river or catch a glimpse of water fowl, fish and other wildlife in the area. 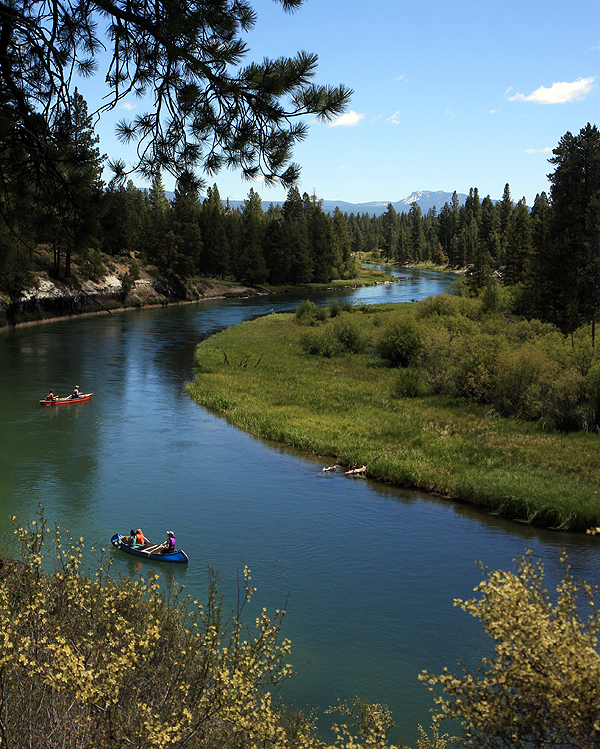 The Deschutes also is known for excellent trout fly fishing, so if you are inclined bring your rod and reel. Next up was a visit to the Don McGregor Memorial Viewpoint, where you are overlooking the Deschutes River and as we were there we saw several families canoe past on the calm, winding river – and even some fishermen doing some catching. The parking lot is about 200 feet from the viewpoint and from there you can see the Newberry Volcano during clear days. The viewpoint also is a stop along a 10-mile trail that goes around the park. The trails are flat and have stunning views of the area. Mountain Bikers, walkers and equestrians can use the trails, and it’s a great way to get to see the different areas of ponderosa forest. The park also has a day-use area with bathrooms and showers that are under the canopy of big ponderosa trees and a great place to let the kids run, play Frisbee or sit and watch the water flow by. The day-use area is the perfect location to start your hike, bike or ride, and having a full-service bathroom there is nice if you are in the middle of a road trip and use the park for a place to stretch your legs. Basically the park offers you an intimate view of the Central Oregon landscape, with ease. While there are some hills, overall the trails and accesses are very easy to navigate and use. The park is maintained beautifully and with it being only 27 miles southwest of Bend, it’s a friendly spot to visit if you want to explore nature, without being a pro. Each year the park has more than 169,000 day-use visitors and it also has 80 full-hook up sites for RVs and more than 45 spots for parking with water and electric. I want to go back and visit when I can take advantage of the log cabins, as it looks to be a great way to explore the entire park, and not have to do the full-on camping experience. For those of you with significant others who only camp with room service, the five deluxe cabins in the park have two rooms, sinks, refrigerators, microwaves, bathrooms and, yes, even hot showers. Sadly no room service, but it is a happy medium – and I may just convince my wife to give one a try. What to bring: Comfortable shoes, binoculars, fishing pole, weather-appropriate clothing are all things that will help you visit your stay better at the park. Tip: Whatever amount of time you think you are going to spend in the park, double it. We planned on staying for two hours and ended up hiking and exploring for half of a day and were sad to leave. If you like easy hiking and nature, this is one of the best parks I have visited. Also, if you have your fishing license, throw a rod in the car and attempt to catch a trout on the Deschutes River. There were several people bank fishing – and catching – while I visited and I wished I had had my gear. Season: The park is open year-round. During the winter months it does get some snow, but not enough to cross country ski normally. Getting there: Drive south on U.S. 97 from Bend or Sunriver to the turnoff for La Pine State Recreation Area. The park is three-miles west of the highway, approximately 27 miles from Bend.